This page is under construction and will updated. Keep checking back! Q1. How much is delivery and how long will it take. A. For an accurate shipping quote, simply add the product(s) you are interested in to the cart, go to the cart page and then enter your address details and that's it! Delivery depends on your location and chosen shipping method but on average 2-4 working days for most places in the world. We always send a tracking number when an item has been shipped so you can follow exactly where your item is. Q2. How do I connect the Matrix up? A. It's simple and here's a short video showing how! Q3. My guitar cab has x number of jack sockets on the back...which one do I plug into? A. If you are unsure refer to your manufacturers manual regarding the correct input. Just because a cab has more than one jack socket on the back, doesn't mean it's a stereo cab. Certain cabs have link outputs which are for linking another guitar cab to. Never connect the outputs from the Matrix amps to a link output on a cab. Orange cabs sometimes have these and don't label the parallel out either! Some other cabs are also like this. You'll be effectively connecting both outputs of the Matrix together...this is bad! Think crossing the streams in Ghostbusters bad! Think canoeing up a brown river using only your hands bad. You get the picture. It will kill the amp. Always remember to use the correct switching mode on cabs that have a selectable input. Don't plug into both inputs when it's set for mono and for safety, unplug from the cab before changing the switching. b I'm not lighting those lights up...is there something wrong? A a. They're there to give you a rough estimate of how much power you are delivering. See the speaker charts below. b. No. If it's loud enough for you then no problem whatsoever. A. Ok some basics here. The Matrix amps are basically attenuators. That means that to achieve full power at it's specified load it requires a signal of .775v (0db) and the volume knobs up full. 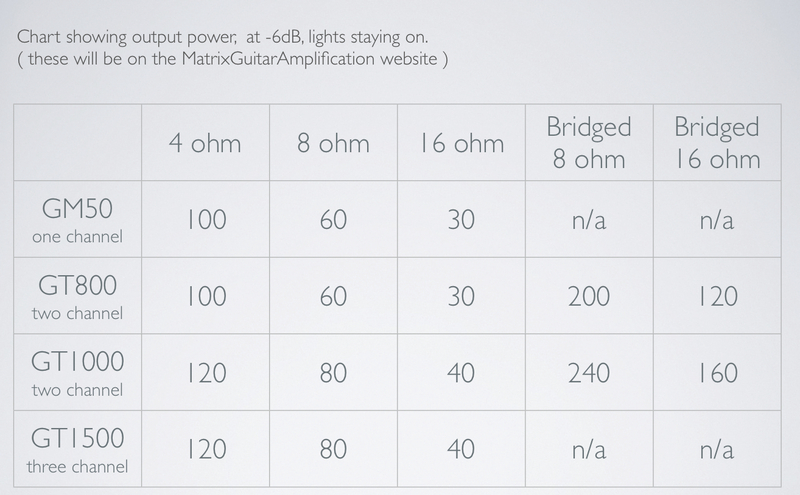 If you put a higher level signal into the amp, it will achieve it's full power rating earlier than at full volume position and inversely, if you put a lower level signal in, say -6db, the amps full volume will always be -6db of full power rating. If your volume is lower than expected even with the Matrix amp on full then look to increse the signal level going into the amp. This could be the individual patch volume or the master volume of the unit or indeed the send level of a preamp. Be aware of the noise floor of a unit as well. Turning something up full will usually turn up the amount of noise the unit generates. The Matrix units are obviously designed to be turned up full and have a low level of noise/distortion but you may experience issues if you turn up the signal being fed into the Matrix too much and have the volume of the amp set too low. Q6. Your amp gives 32.5 gigawatts and my cab is only a 60w. How can I stop the speaker blowing? A. The Matrix amps come equipped with useful signal light indicators (located near the volume controls). These give an indication of how much power the amp is providing at a given load (impedance). They will start to light up (flicker) when the amp is delivering -9db (12.5%) of it's power. The lights will stay solid at -6db (25%) of it's power. (Every +3db increase requires a doubling of power). 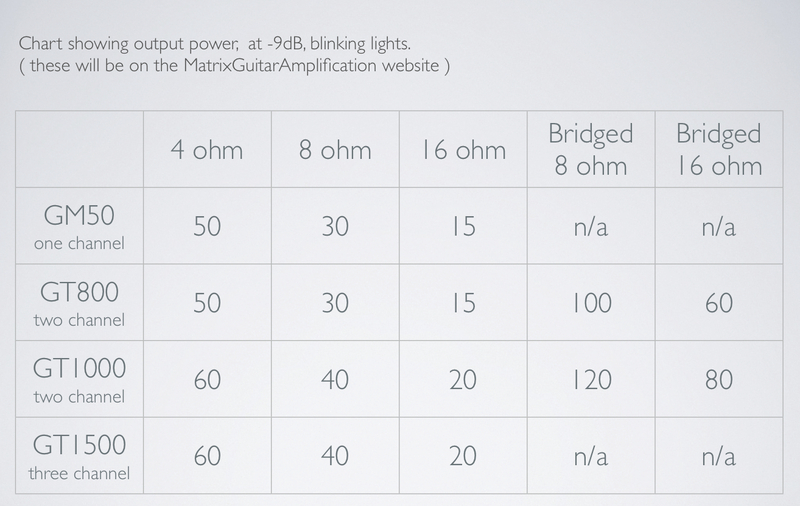 You'll find below the charts that give an indication of what power the amp is delivering when the lights are flickering and solid. You will probably find that your stage volume will be somewhere between the two, around 60-80w. If your volume is enough without lighting up the signal lights, that's fine. If you find that you need more power however, make sure your cab is capable. Q7. Do I have to connect a load to both outputs ? A. No, you can consider the amp as two separate mono amps whilst the mode switch is set to the stereo position. Unlike a valve amp it's perfectly safe to have a output running without anything connected to it. You can leave the second channel unplugged, or connect another instrument through it. Q8. Can I use different speaker loads on different outputs? A. Yes. You can connect different ohmage speakers to differnt outputs. ie. If you have an 8 ohm cab and a 16 ohm cab you can run one from output A and the other from output B with no problem. The amp will work just fine provided you do not connect a load less than 4ohms to each channel, or less than 8ohms when connecting in bridge mode. Q9. My amp wont fit in my rack! How do I take the rubber feet of the bottom of the amp ( and put them on again ) ? A. The shiny plastic inserts inside the rubber feet are clips which hold the feet in. Carefully work a small flat blade screwdriver underneath the edge of the shiny plastic part and prise it outwards. The rubber foot will now come off. If you need to put the feet back on then pull the plastic insert out from the rubber slightly so the flanges/petals are closed by the rubber foot. Align back with the hole and push to pop back in. Q10. I'm getting a pop noise when I turn on the amp is this normal? A. Yes. It's fine. Although we do use a soft start protection circuit, you'll still get a small pop. This won't hurt your speakers. We advise turning on the Matrix amp last in the chain as the amp will amplify whatever is ahead of it signal wise. (modeller or fx unit) Therefore if a piece of equipment up the signal chain makes an unexpected loud noise as it turns on, you dont necessarily want to send that to your speakers. When powering down turn the Matrix amp's volumes down then power the unit off first, to stop any any unwanted signals getting amplified as you turn the other equipment off. Q11. Can I use a normal guitar cable to connect my amp to the speaker? A . NOOoooooooo!! under no circumstances use a standard guitar or instrument lead to connect the amp to the speakers. At best you'll damage the cable and at worst you'll blow the amp, also risking electrocution and a possibility of the world as we know it ending! Seriously though, not a good idea. Just use an existing speaker cable you know works or go to your local guitar store and get a decent quality one. It's worth it in the long run! In a similar vein, don't use a speaker cable to connect your preamp or modeller to the inputs on the amp as the greater resistance of the cable will cause tonality issues! Q12. What's the difference between the GT800 and the GT1000? A. 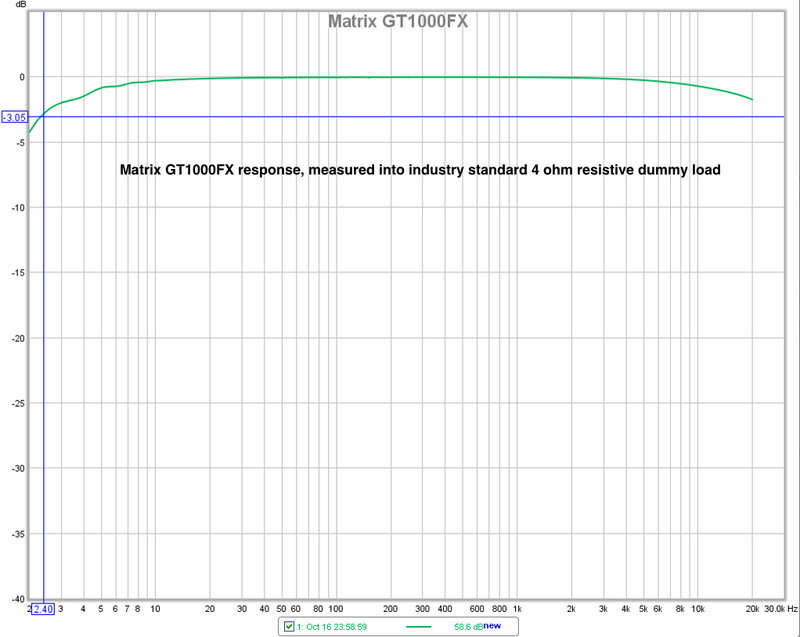 In the simplest terms, the GT800 sounds a bit more compressed in the low mids than the GT1000 which is why we describe the GT1000 as sounding more "open". There is a technical reason for this which is all part of the design of the amp range and something we like to keep to ourselves. Power wise, the GT1000 will give a bit more clean headroom at 16 ohms as well although volume wise, there is only a small difference between the two amps. Q13. Why do all your amps have such high power ratings when all I need is 50-100w? A. The power ratings for our amps are given for a 4 ohm load. 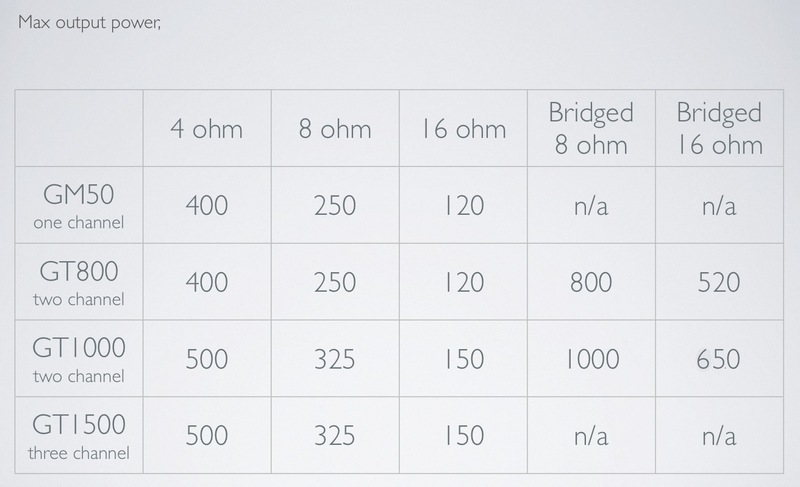 When this load increases to 8 ohms, the power rating drops (see attached chart) and for 16 ohms drops even further. We designed the amps to make sure there was enough power running at 16 ohms to give sufficient headroom and avoid any clipping issues. Q14. I've heard your amps aren't flat response...is this true?